Spring is the best time of year in Paris. Everyone is excited to don their new clothes and show a bit more skin, and terraces fill up in the early afternoon and stay busy until late, even in the middle of the week. It's the start of a new season of cultural and sporting events all over town, so if you're getting dizzy trying to sort out what's worth your attention, here's our calendar of the key things to do this season. 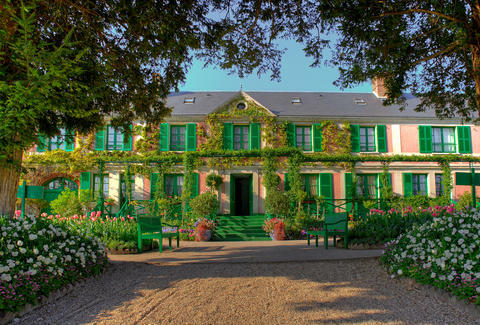 Lesser-known than many of the bigger museums, La Maison Rouge features work from private art collections and hosts interesting, well-curated exhibitions. L'Esprit français, Countercultures, 1969-1989 chronicles two turbulent decades and should live up to the foundation’s high standards. Pirate radio stations, dandyism, and sexual liberation themes are just a few of the subjects on display. As it's arguably the best museum in Paris, there is literally never a bad day to visit the Musée d'Orsay. This beautiful exhibit, Le paysage mystiques de Monet à Kandinsky, boasts works from Monet, Gauguin, Tom Thomson, Gustave Klimt, and Emily Carr, amongst many others, and explores their emotional landscape works throughout a restless and searching era in art. Exquisitely presented by a team of well-known curators from the museum, along with Canadian modernist aficionado Katharine Lochnan, it is the must-see art exhibit of the season. Rub shoulders with independent wine producers and taste your way through the extensive selection of varietals on display, ranging from bodylicious reds from Medoc by the Atlantic coast to delicate whites from Alsace. The Salon des Vins des Vignerons Indépendants is the perfect opportunity to stock up on wines for many a dinner to come. For Parisian runners, the marathon and the half-marathon in early March are the most endorphin-boosting races of the year, offering a scenic route through the city we all know and love. If you aren't a runner, cheering athletes on from the sidelines is just as exciting as the race itself. Refined culture meets street art when the classical Paris ballet company takes on the challenge of bringing life to three iconic pieces from the American school of dance. The set for Merce Cunningham's 1968 Walkaround Time is based on design by Marcel Duchamp while the visionary dancer/choreographer/creative consultant Stephen Galloway has created the costumes for the two Forsythe performances, Trio and Herman Schmerman. With this number of brilliant minds involved, the result should be amazing. If not, you still get to spend time inside the beautiful baroque Palais Garnier. The late Egyptian-Italian singer returned to the spotlight posthumously after the documentary about her life and career, A Life Unbearable, received critical acclaim. She is so in vogue that the Museum of Fashion Paris has put together a captivating exhibition that takes you on a trip through her extravagant closet. On the night of May 20, museums around Europe stay open late (generally to midnight) and entrance is free. If you're in Paris that evening, you basically have free rein to run around some of the best museums in the world without having to pay a dime. We recommend the smaller and lesser-known museums to avoid too much of a crowd: The Musée Gustave Moreau is famous for its staircase but also contains a collection of the symbolist artist's works, while the Palais de la Découverte is the place to go if you want to see a room decorated with the first 707 digits of pi. Or, if you have a morbid fascination with taxidermy, the Musée de la Chasse et de la Nature is a given, while the Musée du Génvral Leclerc and the Musée Jean Moulin chronicle the resistance during the WWII occupation of Paris and the liberation of the city. And the Maison Balzac, the home of the famed novelist, gives you a great reason to stroll through the gorgeous neighborhood of Passy. Better start planning that itinerary. For a few days every spring (dates are still TBD, but last year's edition started May 21), all the cool kids gather in the area between the Canal Saint-Martin and the 10th arrondissement for this annual street art festival, Print Printemps des Rues. Painting, dancing, and other performances abound in this hip area. The vast Parc de la Villette in the far northeast corner of Paris has been up and coming in the last few years, offering not only the Paris Philharmonic and an excellent technical museum, but also loads of outdoor activities like street art exhibitions and food festivals. Villette Sonique is a yearly festival, providing several stages for independent music in the Cabaret Sauvage, the Grande Halle, and even the Philharmonic. This isn't Coachella, so dress accordingly. On the magical night of Fête de la Musique, the entire city turns into a party. Organized concerts and impromptu jam sessions line the streets in the central parts of the city, where people drink and dance at these free concerts. The program for the 36th edition of the event is not available yet, but the extensive selection is bound to offer everything from Argentinian tango to electro. Robin Watts is a writer and advertiser based in Paris. This spring, she is all about art, live music, and finding the best spot in the sun. Follow her on Instagram here.